A black toothpaste to make your teeth whiter! For the last 2 weeks I’ve been using the Diamond Whites Black Edition Tooth Paste and Tooth Polish. The products contain charcoal, making them a natural whitener and giving them their black appearance. 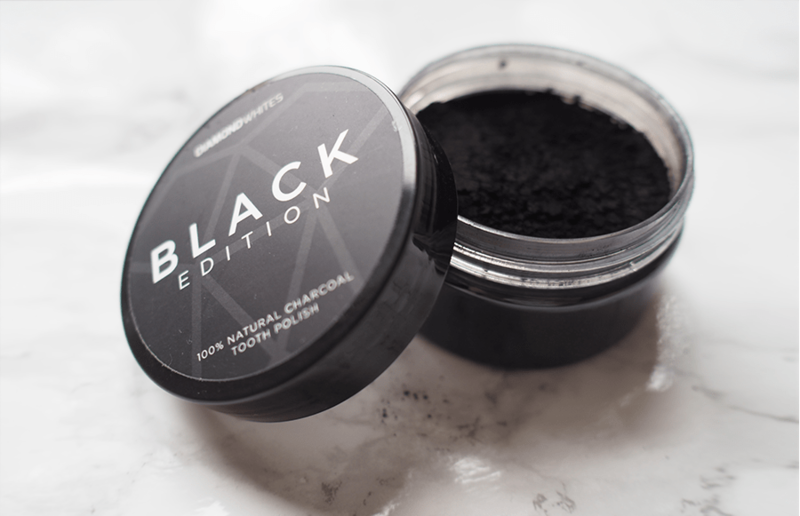 We’ve seen charcoal appear in all types of beauty products recently (and even in our water bottles), so it’s no surprise the Diamond Whites range has been so popular. The inclusion of charcoal is brilliant for those who prefer more natural ingredients in their daily routine. The Black Edition Paste has a fresh minty taste, leaving my teeth feeling clean and my mouth refreshed. The black paste foams into a grey lather which momentarily emphasises the yellow-ness of my teeth. After two weeks of use, twice a day, I have noticed a difference from using the product. The yellow-ness of my front teeth has begun to decrease. However, I assume it may take longer than two weeks to notice large differences (it didn’t help that I got too excited to use the paste that I forgot to take a BEFORE photo). The Black Edition Tooth Polish is certainly a lot of fun to use. The polish comes in the form of a jet black powder that you use after brushing. The powder turns your teeth totally black, and after a couple of rinses your teeth look whiter and shinier than ever. If you have quite tight teeth like me, be sure to rinse very thoroughly as some of the polish made a habit of getting stuck between my teeth. Also, as the product is black it can be quite messy on your white bathroom; be mindful not to spill. Overall I would say the Diamond Whites Black Edition products are great for anyone wanting to try an alternative whitening toothpaste or prefer to use natural ingredients. Plus, scaring your partner with a mouth full of black teeth is just excellent. Go to the Diamond Whites website to take a look at their full range and where you can get them! Duck and Waffle is having a midnight feast that you need to go to!